Ripin (third left) monitoring the construction of a new school hall at SMK Riam accompanied by school administrative staff. MIRI: Work to construct the second bridge in Kampung Lusut, Lambir in Taman Tunku here is currently at the design stage. 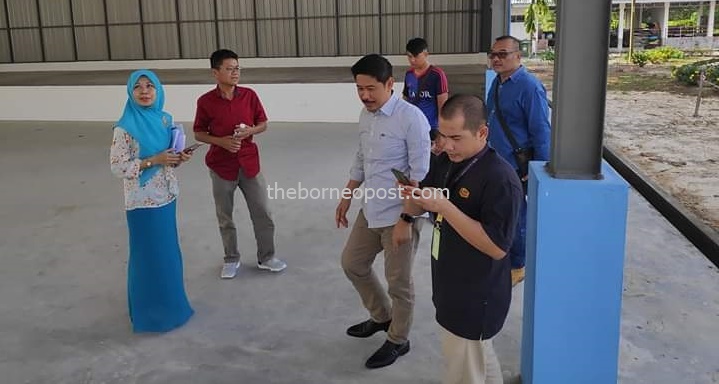 Lambir assemblyman Ripin Lamat said the construction of the bridge located near SK Temenggung Datuk Muip has been approved by the Sarawak government with RM500,000 Rural Transformation Programme (RTP) allocation. “Land acquisition for the construction of the second bridge in Kampung Lusut located near SK Temenggung Datuk Muip has been approved by the state government with RTP allocation of RM500,000. “We are currently waiting for the design work to complete and hope that JKR (Public Works Department) as implementing agency will speed up the construction of this bridge,” said Ripin. Ripin said the bridge will better facilitate students from SK Temenggung Datuk Muip and SMK Riam. “It will also provide short cut for residents of Kampung Lusut to schools and commercial areas in Taman Tunku,” he added. Earlier, Ripin visited SMK Riam to monitor on the latest work for the first phase of the construction of a new hall at the school. The RTP project costs RM400,000 for its first phase. During the visit, Ripin revealed that an additional RM200,000 has been allocated for the second phase of the project. He also handed over RM20,000 in minor rural project (MRP) grant to the school for student activities. The post S’wak govt approves construction of second bridge in Kampung Lusut appeared first on Borneo Post Online.